After the attack on Phantom Lord ends in disaster, Makarov is left near death, his magic power drained. Natsu discovers that Lucy has been kidnapped, and rushes off to save her. He arrives just in time to save her from her own escape attempt. After the insult Lucy serves Master Jose, Phantom Lord’s guild building attacks, turning into a giant transformer capable of using a powerful magical cannon and the Abyss Break spell. Natsu, Elfman, and Gray infiltrate the guild to take it down from the inside. There they confront and take down two of the Element Four, while Gray’s battle against Juvia begins. This arc marks a high point in this series for me. It was the first really big arc that had consequences that stretched beyond any individual job. Up to this point the aftermath of any given arc was contained to that arc alone. But in this case, with the near complete destruction of the guild the fallout cannot be contained to this arc alone. For many long running shonen action and adventure series that focus on an arc by arc structure the tendency to keep elements of each arc contained to said arc is fairly common. I’d say this is the moment where Fairy Tail’s willingness to work outside the initial constraints work to make it one of the more worth while long running series. Fairy Tail Vol. 7 even manages to sneak in a tiny bit of satire of other shonen series. While this may be me reading too much into it, I like to imagine that Mashima took the opportunity to mock the overuse of rescue arcs in shonen manga by having Lucy rescued within a single volume. While reading this and the last volume for the first time I was worried that we would have to put up with the seemingly obligatory rescue arc, but was pleasantly surprised when Lucy managed to save herself for the most part. This was a great character moment for her, because it allowed her to be an actual character capable of taking care of herself, and not a plot related tool. Admittedly she needed some help from Natsu at the most crucial part of her escape plan, but in a series that emphasizes teamwork and friendship so much that can easily be forgiven. Elfman’s fight, while brief and against a forgettable character, bears all the marks of a great shonen fight. The thing to keep in mind is that most major events in a shonen fighter series need to take place in the form of a battle of some kind. The bad shonen fighters stick with basic battles, the good shonen fighters take those battles and tie in whatever the plot or character requires. In this case we get the payoff for a minor plot thread regarding Mirajane and her brother Elfman. The story being that Elfman’s powers had been blocked, restrained to only his arms, because the last time he attempted to use them completely he went berserk and caused the death of their younger sister. Dead family members are a staple of shonen series, but it’s good to see it well mixed with the other main element of the series, the battles. Natsu’s fight against the first of the Element Four is forgettable. While it’s entertaining on its own, it fails to leave a lasting impact, and because Natsu has had many fights even by this point it’s difficult to provide that extra needed spice to really make it stand out. Elfman’s opponent was just as forgettable as Natsu’s, but where Elfman had a grand character moment, Natsu instead has just another fight. The first half of Gray’s fight against Juvia is amazing. This fight, which carries over to the next volume, is possibly my favorite fight of the series purely because of how well Mashima mixes action with comedy and character moments. Juvia in this first instance reveals herself to be a little bit different from her initial representation. While she came across as a gloomy, emotionless woman, we discover that she has an as of yet unexplored emotional depth to her. Or, in normal person speak, she falls head over heels for Gray after just exchanging a couple sentences with him. What follows for the rest of this volume is a wealth of character development that takes Juvia from her emotionless state, pulls her through the initial infatuation, right to the rage of perceived heartbreak as she perceives Lucy as a rival for Gray’s affection. Sure some might call her a lunatic that Gray should run far, far away from. But when their first meeting is this entertaining and funny I for one wouldn’t mind if Gray has to suffer a bit longer at the hands of this insane yet charming young woman. In the end Fairy Tail Vol. 7 has comedy, drama, high stakes, and character development all wrapped up in a nice combat package. 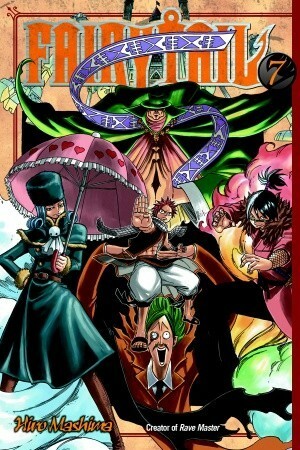 This is a volume that anyone unsure of Fairy Tail needs to read to get a real sense of what makes this series so great.